Whoever frames the discussion Wins the discussion. We have to allow the Bible, not the media, to set the framework for our discussions on solving the problems we face. You will never win or solve any problems that you allow the media to set the framework for. The media is set up specifically for the purpose of entertainment and endless political controversy and debate. It draws ratings, eyes, ears, and commercial spending. If I walk into a room full of high school kids that are white and say “You guys will never receive an A in my algebra class until you solve this white-on-white lust problem.” I can really just walk out the back door and laugh at them. I’ve created a framework for them to discuss that has nothing to do with the problem, and distracted them from the resolution at the same time. I can really just walk out the back door and let them entertain themselves and argue about who’s lusting after who while I laugh at them. Are they supposed to lust after other races instead? Will the answers to the algebraic equations all the sudden jump into their head when they figure out how to stop lusting? Biblically speaking, crime is a sin problem. Crime in the inner-city is not about black on black crime, it’s about sinner-on-sinner crime. Ive been to the courthouses and ministered in the juvenile systems. The white boys listen to the same curse filled music and lack the same family structure just like the black boys. 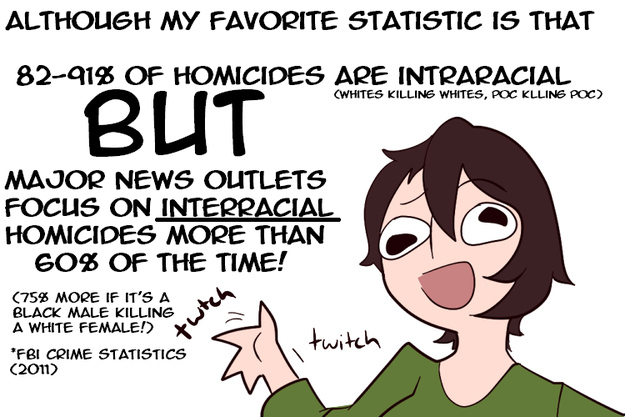 There is just as much white on white crime as there is black on black crime. Color is not an issue NOR is it a talking point. Secondarily, crime is a poverty issue. Proverbs 30 the Bible says “Lest I be poor, and steal, and take the name of my God in vain.” The implication is that the poor have more temptation to steal. Poverty drives up crime and violence, as people find alternative ways to eat. This whole race drama is driven by politics. So much money is driven by politics, media has to push the drama because the more passionate people are, the more businesses and political parties have to spend on commercials. Entertainers are hypocrites too because it’s their lust and sin filled music and movies that help empower the problems they claim to be passionate about solving. Nobody wants to hear about Jesus. The solution HAS to be squashed. Drama has to be kept up so the money ratings and album sales and commercials can keep flowing. Politics and entertainment will always push black versus white issues because it is an unsolvable problem. It’s a fake framework. They leave the room and laugh while they collect the checks and we discuss their endless debates that cannot be solved. We cannot allow the media and entertainment to create a framework for the discussion on problems that we need to solve. We need to allow the Bible to form the talking points for our discussions. Then we can start to solve problems. Yes everyone needs to clean our own front doors, family is first… But my point is, when you allow someone else to frame the problem and the discussion in a way that makes sure the solution is never found, the problem can never be solved. There is only one race and ONE BLOOD. There is a sin problem in that one race. There is a poverty problem. There is a greed and idolatry problem. There is a problem with fathers training and loving their children. JESUS CHRIST is the solution to ALL OF THE ABOVE. The rich and the poor meet together: The Lord is the maker of them all.